40 calories per serving. 57% less sugar than our Original Almondmilk. Soy free! Lactose free! 50% more calcium than milk (1 cup of milk contains 276 mg of calcium vs. 1 cup Almond Breeze Original Reduced Sugar Almondmilk contains 455 mg calcium. Milk data from USDA National Nutrient Database for Standard Reference, Release 25 )! 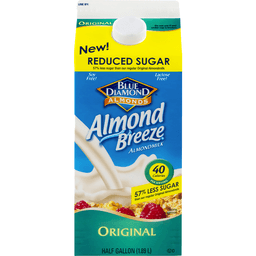 Reduced Sugar Almond Breeze Almondmilk has just a hint of sweetness. 57% less sugar than our regular original almondmilk (Almond Breeze Original Almondmilk 7 grams of sugar per serving. 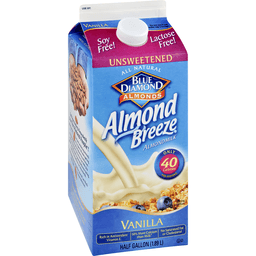 Reduced Sugar Almond Breeze Original Almondmilk, 4 grams of sugar per serving). Free of: dairy, soy, lactose, cholesterol, peanuts, casein, gluten, eggs, saturated fat and MSG. An excellent source of vitamins D & E. Made from real almonds. Vegan. The preferred taste alternative. From the almond people. 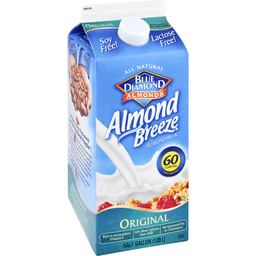 Reduced Sugar Almond Breeze Almondmilk is a great tasting, non-dairy beverage. It is perfect by itself in a glass, in a smoothie, over cereal or for cooking and baking. Delicious tasting Almondmilk from the almond people! Blue Diamond has been producing almonds since 1910. We've spend 100 years getting to know almonds and we believe no one knows them, or loves them, like we do. Our 3,000 plus growers are dedicated to growing delicious tasting, nutritious almonds for our Almondmilk. Try Almond Breeze and see for yourself. We think you'll agree, it tastes delicious! Taste guarantee! Made in a peanut free facility. This almondmilk is made from almonds that were not genetically engineered. Visit us at: www.almondbreeze.com. 60 calories per serving. Non GMO Project verified. nongmoproject.org. Official almondmilk of US ski & snowboard teams. Almondiciously Good! Free of dairy, soy, lactose, cholesterol, peanuts, casein, gluten, eggs, saturated fat and MSG. 50% more calcium than dairy milk (1 cup of 2% fat dairy milk contains 30% DV calcium vs. 1 cup of Almond Breeze Unsweetened Original Almondmilk contains 45% DV calcium. Based on 1,000 mg calcium recommended daily intake. Milk (01079) data from USDA National Nutrient Database for Standard Reference, Release 28 (2016)). An excellent source of vitamins D and E. Made with real almonds. Vegan. Almost Breeze is a delicious way to be good to yourself! 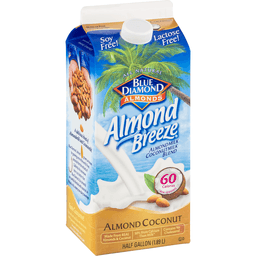 Almond Breeze Vanilla: 80 calories; 13 g sugar, total; calcium 45% DV; vitamin E 50% DV; saturated fat 0 g; cholesterol 0 mg. Skim Milk (Skim milk and 2% milk data from USDA National Nutrient Database for Standard Reference, Release 28 (2016): 83 calories; 12 g sugar, total; calcium 30% DV; vitamin E 0% DV; saturated fat 0.1 g; cholesterol 5 mg. 2% Milk (Skim milk and 2% milk data from USDA National Nutrient Database for Standard Reference, Release 28 (2016): 122 calories; 12 g sugar, total; calcium 30% DV; vitamin E 0% DV; 3 g saturated fat; 20 mg cholesterol. Delicious tasting almondmilk from the Almond People. Growing almonds in California since 1910. Taste Guarantee: If you are not satisfied with the taste, we guarantee your money back. For specific details, visit almondbreeze.com. Creamy, delicious Almond Breeze. Almondmilk with a delicate touch of vanilla. For more recipes visit almondbreeze.com/recipes. Not for use as an infant formula. Manufactured at plant stamped on package. Find us on Facebook. Questions or Comments? Write Blue Diamond customer support, PO Box 1768 Sacramento, CA 95812, or call 1(800)987-2329. Please include code number found on package with all inquiries. almondbreeze.com. Almond milk coconut milk blend. All natural. 60 calories per serving. Made from real almonds & coconut. 50% more calcium than milk (1 cup of milk contains 276 mg calcium vs. 1 cup Breeze Almondmilk Coconutmilk contains 457 mg calcium. Milk data from USDA national nutrient database for standard reference release ). Contains no cholesterol. Soy free! Lactose free! A delicious blend of almondmilk and coconutmilk! Blue Diamond almond growers are known for growing some of the world's finest almonds from the orchards of California. No one knows tree nuts better than Blue Diamond. Our almonds are carefully blended with coconut, to produce a rich, creamy non-dairy beverage. Taste guarantee! Free of: dairy, soy, lactose, cholesterol, peanuts, casein, gluten, eggs, and MSG. All natural with added vitamins & minerals. Made from real almonds & coconut. Contains medium chain fatty acids (MCFA's) (coconuts are one of the best sources of MCFA's - special fats that are easily burned as energy). An excellent source of calcium, vitamin D & E. Vegan. use in your favorite recipes. Made in a peanut free facility. This Almondmilk Coconutmilk blend is made from almonds that were not genetically engineered.